An old book containing six stories about the old West opens up its pages to transfer them one after another to the screen. 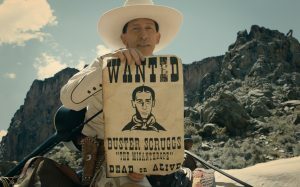 It ranges from Buster Scruggs pistolero singer up to a packed diligence of direct people passing through hangings and strands of gold. The Coens, as is practically their rule, minimize. They claim to have written western stories and then wished to put them together as in the episodes of the Italian Sixties episodes. They wanted the best directors available and are pleased that both (ie they) have accepted. Behind this self / ironic humor lies in fact a quality operation that fits perfectly in line with their way of making films. There is in fact in each of their works a profound culture and one could almost say maniacal who likes to find opportunities for dissimulation from time to time. On this occasion it touches on a genre, the western, which is revisited in most of its founding elements without ever falling into parody or in the quotation of a specific film (others would say ‘tribute’) as an end in itself. Starting from the first episode in which the title Buster Scruggs is a singing cowboy that refers to a type of western that goes back to the introduction of sound in the cinema and that already John Landis had nicely teased in the three amigos. Here, however, immediately the variations on the theme are numerous and all successful. The protagonist is not only comparable to a nightingale but he is also one who knows how to use weapons and who knows how to defend himself even in their absence. The Coens structure their anthology by taking structural risks. Because we laugh and we do it several times in the first two ‘stories’. Then the rice progressively fades but suddenly re-emerge at times. But the quality level that allows the narration of different from spaghetti western to caravans without forgetting the Native Americans, the gold digger and, last but not least, the diligence of Fordian memory. And here it is revealed, in favor of those who had not already taken it before, the thematic fil rouge declined under its most varied aspects.